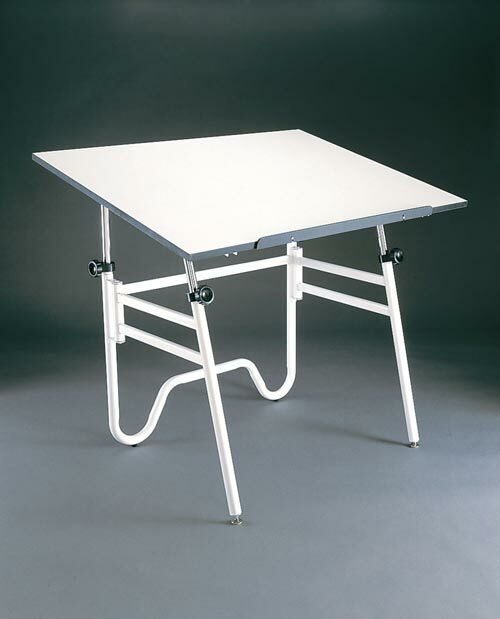 The Spacesaver Opal drafting table folds to approximately 5" in width for easy storage. The Opal table features a unique oval and round tubular base design for stability. It’s perfectly suited to graphic artists or students on the go. Board angle adjusts from 0° to 45° with an adjustable height of 29" to 44". Distance between legs is 283/4". Unique double-bend back legs. Warp-free white Melamine® drawing board. Base available in white or black enamel finish. 260 points will be rewarded when you are logged in to your account and buy this item.